This publication edited by Annette Zimmer, Patrick Hoemke, Joachim Benedikt Pahl and Christina Rentzsch is another publication that came out EU-financed research project Third Sector Impact. It was written in acknowledgement of the many organizations ready to share their time and insights with TSI researchers, a commitment that is a necessary pre-condition for researchers to do their work. The data gathered from case studies, interviews and surveys have been published in multiple working papers, reports, books and articles, underlining different aspects of third sector impact, development and conceptualization. 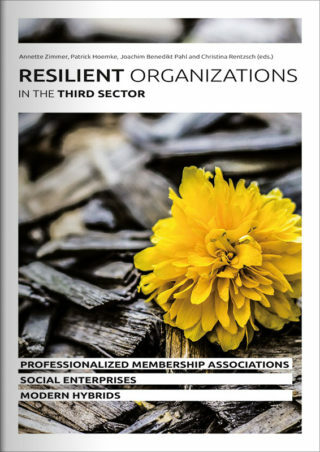 This publication presents 15 case studies of TSOs – membership associations, social enterprises and modern hybrids – working in the fields of in social services, sports, and arts and culture in Austria, Croatia, France, Germany, Spain, The Netherlands and the UK. It traces their strategies of resilience in changing environments marked by austerity and financial cutbacks, lack of public recognition, and rising demands of impact assessment and bureaucracy. This book is a collection of stories of combining different institutional logics as TSOs move towards hybridity, and of the capacity to react to changing environments without giving up on their core missions. The TSOs presented here continue to contribute to the well-being of citizens in Europe through innovativeness, the provision of services as well as avenues for active participation. Cases are embedded in an outline of the major societal, economic and political trends, both nationally and at European level, as EU finding streams and policy agendas also contribute to third sector development.